I added an internal USB Bluetooth module to my AV1050 without sacrificing the existing 2 USB ports! 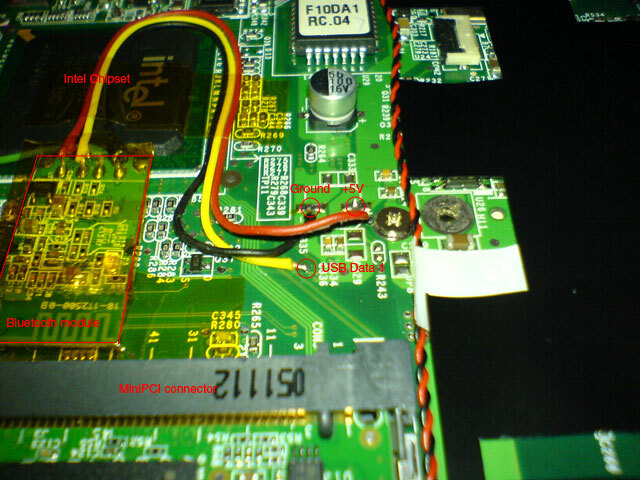 Other people have modified notebooks by adding internal USB Bluetooth modules, but have generally lost the functionality of a USB connector (see link). Here I assume that you know how to take apart your AV1050 (see link), including how to remove the motherboard. I also assume that you know how to perform precision soldering with a fine-tipped low-power iron and that you have access to magnifiers. DISCLAIMER: If you don’t feel confident with taking apart your notebook or with performing precision soldering, then I suggest you don’t try this mod. I’m not responsible if you damage anything. On the AV1050 only 2 USB connectors are available to the user, but 3 USB ports are reported in the Device Manager. 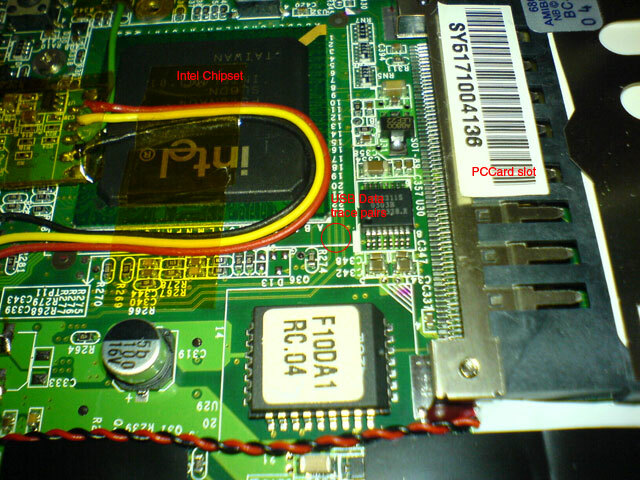 Like many other notebooks the AV1050 uses the Intel Centrino chipset with integrated 852/855 graphics. 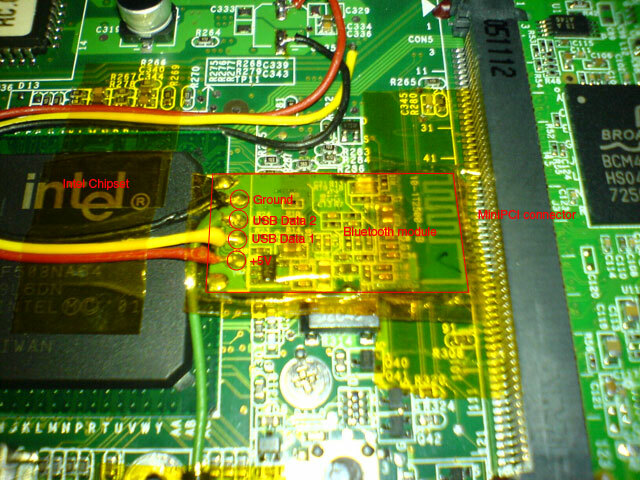 This chipset features an embedded USB controller with 3 ports (see PDF). So where is that missing 3rd port? What can it be used for? One of the missing features of the AV1050 is built-in Bluetooth. I use Bluetooth a lot and I don’t like having an external USB dongle sticking out from one of the USB ports. I looked at the Intel chipset data sheets (see PDF) and located the pins used for the 3 USB ports. After taking apart my AV1050 I disconnected the hard drive and removed the motherboard and looked with a magnifier for traces originating from the appropriate pins on the Intel chipset (which is located underneath the track pad). I noticed 3 pairs of traces running parallel to each other and originating near pin A20 (see picture). I used a multimeter to find +5V and ground points on the motherboard. 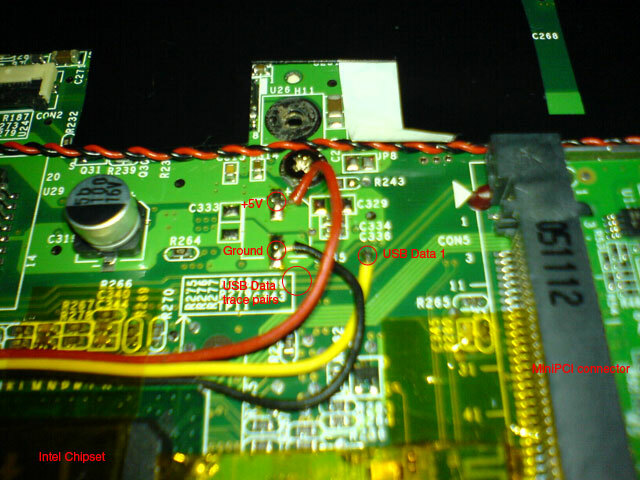 Conveniently I located both very close to USB Data 1 test point (see this picture & this picture). 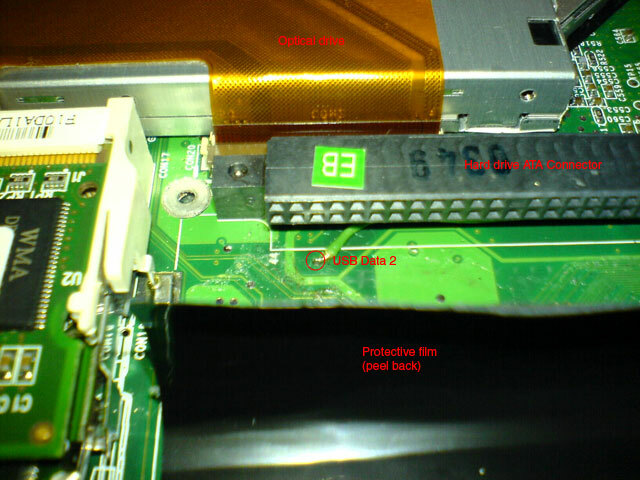 Note that the translucent yellow areas are Kapton insulating tape used to hold everything in place. The tricky part was to package the Bluetooth Module inside my AV1050 without physically interfering with anything else. 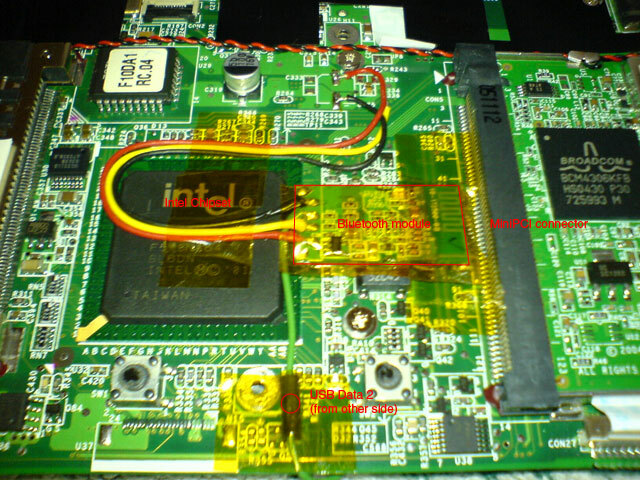 I wrapped the Bluetooth module in Kapton tape and wedged it on the motherboard underneath the track pad between the Intel chipset and the MiniPCI slot (see picture). I reassembled my AV1050 and Bluetooth reception is good. Both USB connectors are also working fine. So there you have it :) I’d originally snapped more pictures but I accidentally deleted them. 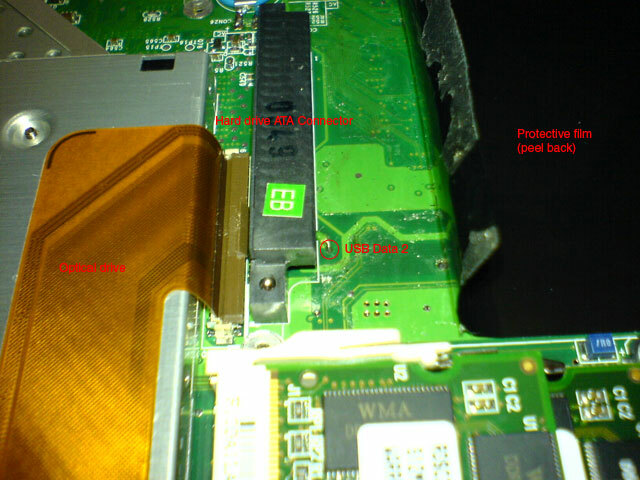 I used my Sony Ericsson W800i to take the pictures and then scaled them down to 640×480 and annotated them. Let me know if you have any objections.. I will remove the post if your disagree to my action. nice. the driver works. apple does not have it on bootcamp or the web. Question: Which kapton tape do you used ? ( not that i order the wrong one). so my question – in general, is the connector on a logic board aimed at connecting a bluetooth card specific? or will I find the 4 normal contactors for USB, and thus connect any (low powered) usb device?